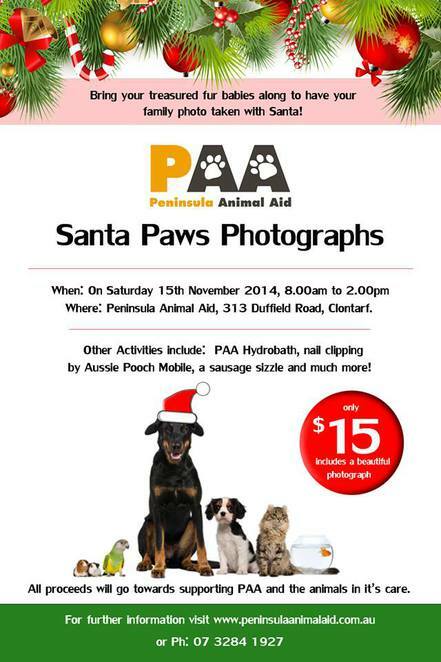 Santa Paws Photographs at PAA, Saturday 15/11/2014, image courtesy of PAA website. Santa's coming to Peninsula Animal Aid on Saturday 15th November 2014. Come along between 8am and 2pm. Bring your four pawed friends and have a photo taken with the jolly old fellow. This is a great opportunity to have a photo with Santa and support the rescue and rehoming centre, Peninsula Animal Aid. Photos will be taken by a professional photographer at a special price of $15. This includes your photographic shoot with Santa and a beautiful photograph. There will also be other items available to order on the day. Aussie Pooch Mobile will be trimming dogs nails for $5. All takings donated to PAA. The Peninsula Animal Aid is a not for profit organisation and registered charity. Their tireless volunteers band together everyday of the year to care for the dogs and cats in between homes. They take them to vets, wash the animals, feed them, clean up after them and they love them. Every single volunteer that works at PAA are there because they love the animals and want a better life for them. I have had first hand experience volunteering at PAA myself (a few years ago now) and I can say without a doubt that these amazing people care deeply about helping each animal to find their fur-ever home. You can be a part of helping animals in need this Christmas by having you and your pets photo taken with Santa. To see the dogs up for adoption - click here. To see the cats up for adoption - click here. PAA is dedicated to the care and rehoming of stray and surrendered cats and dogs. Peninsula Animal Aid is totally reliant on public support, so dig deep and give them a hand. They do an exceptional job. For more information, you can visit the PAA website.